LOCTITE 268 is a high-strength threadlocker for maximum efficacy in the securing and sealing of bolts, nuts and studs to prevent loosening due to vibration. The product serves to permanently lock assemblies which must not come loose. It is available in a stick format and easy and effective in overhead applications. The product works on all metals, including passive substrates such as stainless steel, aluminium and plated surfaces. It tolerates slight contamination by industrial oils, corrosion prevention oils and cutting fluids. 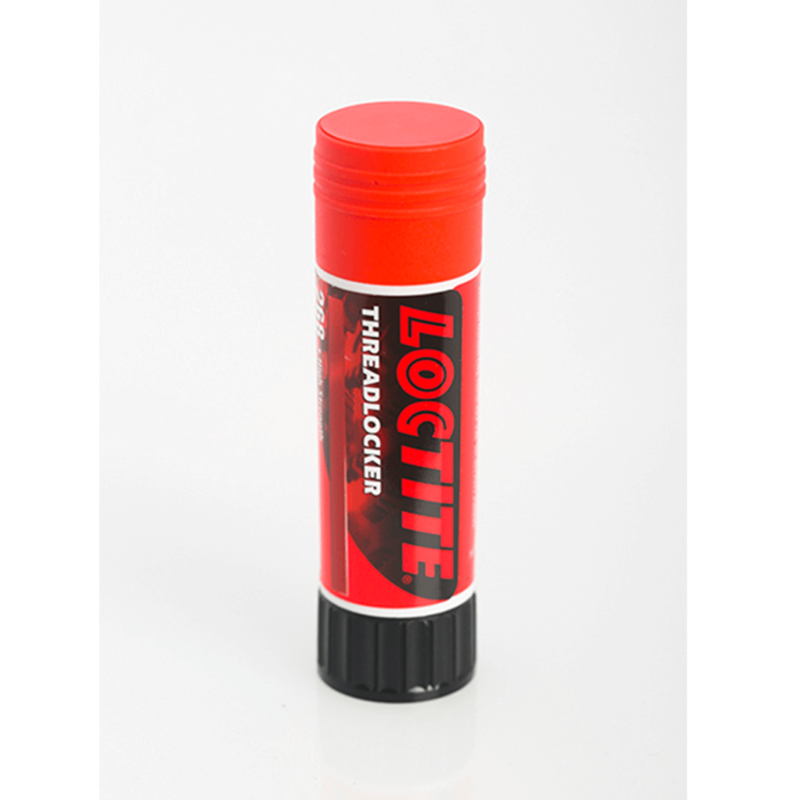 Loctite 268 is a high strength version of an anaerobic threadlocking material. It is supplied as a wax-like semi-solid, conveniently packaged in a self-feeding stick applicator. As with liquid anaerobic products, this material develops its cured properties in the absence of air when confined between close fitting metal surfaces. It achieves consistent strength and can be used on a variety of metal substrates. It is particularly well suited for applications where a liquid product may be too fluid to stay on a part or be difficult to apply. It stores easily and allows for direct contact to a threaded part during application to ensure even coverage. The rate of cure will depend on the substrate used. The graph shown in the data sheet shows the breakloose strength developed with time on M10 black oxide steel bolts and mild steel nuts compared to different materials and tested according to ISO 10964. All samples pre-torqued to 5 N·m. Product applied to bolts only. The rate of cure will depend on the temperature. The graph shown in the data sheet shows the breakloose strength developed with time at different temperatures on 3/8 x 16 degreased steel nuts & bolts and tested according to ISO 10964. All samples pre-torqued to 5 N·m. Product applied to bolts only. Where cure speed is unacceptably long due to large gaps, applying activator to the surface may improve cure speed. However, this can reduce ultimate strength of the bond and therefore testing is recommended to confirm effect. The graph shown in the data sheet shows the breakloose strength developed with time using Activator 7471 and 7649 on 3/8 x 16 zinc dichromate nuts and bolts and tested according to ISO 10964. All samples pre-torqued to 5 N·m. Product applied to bolts, activator to nuts. Oil Tolerance: M10 black oxide steel bolts and mild steel nuts degreased and then reoiled in noted oil type. Data presented as a % of unoiled control.